You can learn a lot about an ecosystem by studying a small slice of it. 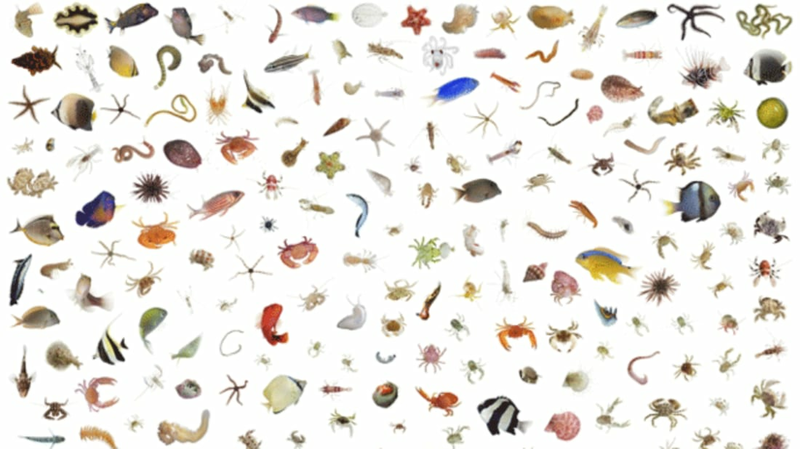 That's exactly what photographer David Liittschwager did for a new exhibit titled "Life in One Cubic Foot," located at the Smithsonian's National Museum of Natural History, CityLab reports. To capture his images, Liittschwager stationed a square, 12-inch box frame in different locations around the globe. Every visible life form that passed through the "biocube" in a 24-hour window was recorded. Then, Liittschwager used the specimens he tallied to create hyper-concentrated snapshots of the wildlife present in that specific place and time. The photo series includes exotic locations, like the reefs off the Polynesian island of Mo'orea (pictured above), as well as more urban environments like New York City's Central Park. Even though most people don't associate Manhattan with a vibrant wildlife population, Liittschwager's bio-portrait of the Hallett Nature Sanctuary proves the city is home to a wide range of biodiversity. According to the Smithsonian, there are still more than one million species on our planet waiting to be named or discovered by scientists. In addition to highlighting the plants and animals we already know, the project seeks to show how much we've yet to learn. You can check out more photos from the exhibit below.